[pain]Byte a datadrivendance classical ballet performance and VR (virtual reality) experience looking at ballet, biomedical engineering, chronic Pain (Spinal) and networks using 3biometric data and an accompanying VR experience. Online resources will be shared to enable others the ability to remix share the data visualisations using our motion/Skeleton data to create different effects. We will be using biometric data in the development and performance of the ballet. This new ballet, [pain]Byte, is all about chronic pain and biomedical engineering. It looks at what it means to be in pain through dance and imagery using technology such as: data visualisations, bio metric data, wearables and projections. It links computing with medical and how data is transmitted across networks to how pain signals are transmitted through the pain pathway within the body. The live theatre and VR experience research will be focusing on how the audience’s exposure and understanding are impacted by the difference mediums used for painbyte. We are really pleased to be working with TOMTech The Old Market, Theatre in Hove. #TOMtech: Supports artists that use technology to hone their craft. What does it mean to have chronic pain, how does it feel? The choreographer and producer both suffer from chronic pain and have different spinal implants. Using their data and experience we want the audience to connect emotionally with the idea of living with pain without them, the audience, experiencing any pain.How sufferers hide their pain and the benefits of technology specifically biomedical implants such has high frequency spinal cord stimulators and their positive impact of the sufferer. The piece will consist of a talk by an expert linked to the piece such as a Data Scientist, Pain specialist or Science communicator followed by the ballet performance and VR experience. Debut Spring 2017. Story: using data as storytelling and ballet as narrative. Technology: VR, Projections, data visualisation, LEDs and electronics (wearables) linked to human data (biometric) and motion. The second digital ballet to accompany [arra]stre from 2014. 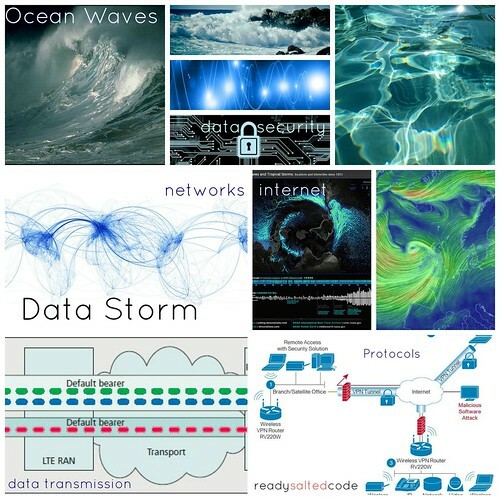 A data driven dance performance about ocean storm and computer science theory. The theory for this ballet is all about data transmission, security, protocols, internet, networks and weather. This dance performance will include visuals derived from data along side videos projected onto 3D objects to enhance the audience experience. The live performance will be supported by an art and video installation prior to the live performance. The installation exhibition will enable audience to interact and view close up the technology and wearables that will be used in the performance. We will be working with data from The Met Office using climate information to influence the choreography of the ballet. Arrastre: is a digital data driven dance performance that derives its movements and concepts from computer science theory. A live performance, plus a series of workshops breaking down the computer science theory behind the performance, will constitute the whole programme. The programme will include data visualisation, images influenced and triggered by data from the dancers, wearable technology and choreography. The work will interpret computer science theories through dance, relating the programme to the new Computing curriculum for schools in England; devising a new methodology that could be applied as a cross-curricular approach for learning. It is with great thanks to Thomson Reuters and Arts Council England’s Grants for the Arts Award for the supporting this project. The accompanying educational site Art of Computer Science was produced due receiving one of Google’s RISE awards for Computer Science Education. Without this award we would not have be able to produce this amazing resource or the Ballet that is the inspiration for the whole project.